Advanced Micro Devices, also known as AMD, has quietly unveiled a new video card under the brand name Radeon R7 350. 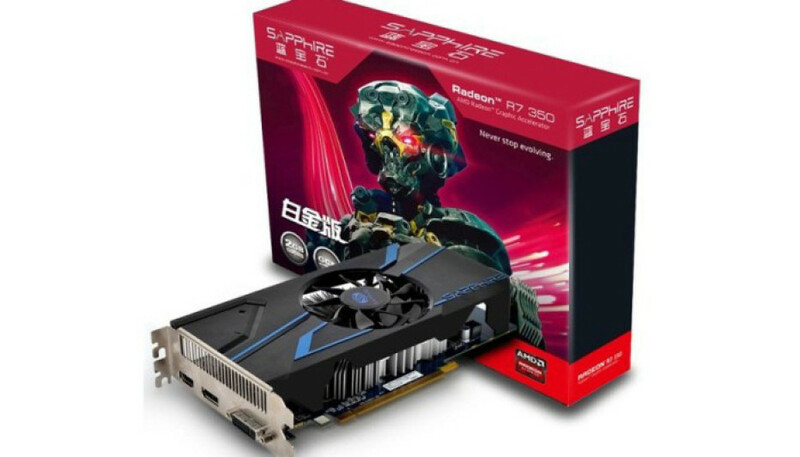 The new card is available on the Chinese market only as of now and currently there are just two models made by XFX and Sapphire. Judging by the name the Radeon R7 350 is a low-end card and the tech specs confirm this – the card is equipped with an AMD Cape Verde Pro 2 GPU and has 2 GB of GDDR5 memory. The GPU packs 512 stream processors and runs at 925 MHz, while the memory operates at 4500 MHz and pushes data through a 128-bit memory bus. In a few words the Radeon R7 350 is a Radeon HD 7750 video card that has a faster GPU. Due to the hardware used the card needs just 50 watts of power. Depending on the model the Radeon R7 350 is equipped with a D-Sub connector (XFX version) or a DisplayPort (Sapphire model). It is unclear as of now whether the cards will become available outside of China so time will tell. As to pricing the Radeon R7 350 sells for 599 Chinese yuan, which is around USD 90.